June – September: Weather Conditions Permitting: Experience two dives in one day to at Coral Island. It is all inclusive of equipment, drinks, snacks and hopefully some really nice diving. The price of THB 2,990 per person is the cheapest day trip Scuba diving experience you will have in Phuket through the low season. It is a great price for an introduction into the amazing world of scuba diving. The travel time on our luxury speedboat to Coral Island (15 minutes), Koh Mai Thon (20 minutes) or Koh Bon (10 minute) are just minutes from the boat departure point of Chalong Bay. This compares to the big dive boats of 1.5 hours each to Rocha Yai, 2 hours each way to Racha Noi and 3 hours each way to Phi Phi. 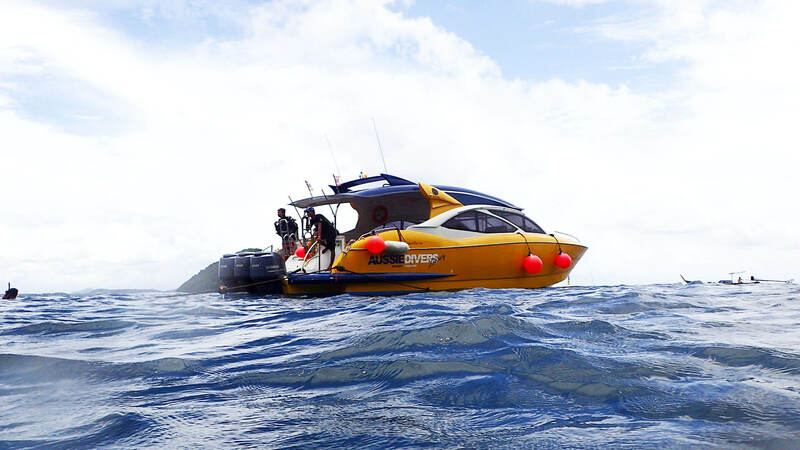 This is important to you because during to wet season the waves are higher and boat travel can be very uncomfortable. The bigger waves make for more motion sickness. Sea sickness is a kill joy for Scuba diving, Given that these islands are just outside the protected bay of Chalong we have hoping that we can prevent our divers from getting sea sick. We plan for a later pick up of around 8:00am and hope to have you back at Chalong before 1:00pm and to your hotel around 1:30am. The standard two dive Scuba diving day will see you picked up around 7:30am and return to your hotel between 3:30 – 4:00pm. This should give you plenty of time to enjoy other activities on the island such as Tiger Kingdom, Big Buddha and Wat Chalong. We believe that the marine life at these islands is on par with that at Racha Yai (the next closest day trip island). Staff have found a wide range of marine creature that should keep the novice diver more than happy. Lionfish, Scorpionfish, Barracuda, Cuttlefish, Eels and a range of common reef fish are all found in safe shallow waters. Please be aware that the visibility on the islands close to the mainland of Phuket is not that of some dive sites in the area. At times it can be very reasonable at about 10 metres however at times it can be less and on average will be between 5 – 8 metres. This will not provide your with the crystal clear waters that some scuba diving pictures show. The below pictures have all been taken at Coral Island. The visibility will still allow you to see many cool marine creatures. Have you ever wondered what it’s like to breathe underwater? If you want to find out but aren’t quite ready to take the plunge into a certification course, the PADI Discover Scuba Diving experience will let you try scuba to see if you like it. We offer different versions of this program, either in a pool or in the beautiful Andaman Sea and it is sure to be the most exhilarating activity of your Phuket holiday. While not an actual scuba certification, while doing the Discover Scuba Diving experience you’ll learn how to use scuba equipment in shallow water and get a quick and easy introduction to what it takes to explore the underwater world. This will be the best fun you will have on your Phuket holiday, no question. Packages start from THB 2,900 and you can experience the thrill of scuba diving on Coral Islands which is one of the closest islands to the Phuket mainland. Coral Island is 20 minutes speedboat ride from the the boat pier in Chalong Bay. With this trip you will most likely do two dives at Coral Island. Would have given it 100 if there was an option on TripAdvisor… My first ever dive, and these guys made it such a wonderful experience. The entire trip was organized flawlessly.. From the pick up to the drop back at the hotel. We were given a little training in the pool one day prior , which was very helpful during the dive. Astha Pawar Bengaluru, India. There is nothing like breathing underwater for the very first time. It takes a little getting used to, after all, human beings weren’t designed to do that – but after a few minutes of awestruck wonder, most participants realize how easy scuba diving really is. The biggest challenge instructors have with the PADI Discover Scuba Diving program is not coaxing participants into the water, but coaxing them out when the program is over. The fun part? It’s all fun! Please note that it is a breach of PADI Safety rules and regulations for your instructor to take photos during this activity. As a responsible, safe and professional PADI 5 Star IDC Centre your instructor will comply with these rules. This will ensure that you will have safe and enjoyable dive. Any dive centre that states they will take photos during the PADI Discover Scuba diving is breaching these regulations and safe scuba diving practises. When breaching such standards most insurance companies will void both your insurance and the insurance of the dive centre. As a professional PADI 5 Star IDC Dive Centre, Aussie Divers Phuket will always place you safety above the need to take photographs. At least 10 years old and be medically fit to scuba dive. Aussie Divers Phuket, the best instructors, best dive sites, best boats at the best prices.